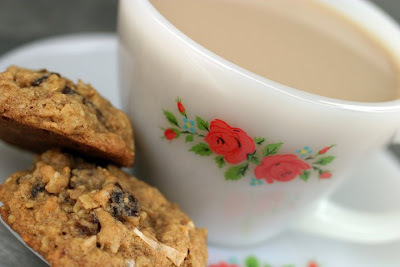 I wanted to make a cookie with some of my favorite ingredients and created this not too sweet, hearty cookie, that’s great with a cup of coffee in the morning. For an over the top variation this cookie would be great with the zest of an orange and/or a cup of chopped toasted walnuts. Using a mixer cream together butter, brown sugar, granulated sugar, eggs, molasses, vanilla extract, coconut extract, fresh grated nutmeg, and salt. Once combined and fluffy add baking soda and baking powder and mix briefly. Add Flour and mix until just combined. Add Oatmeal and mix until incorporated. Mix in dates. Using a standard size 50 cookie scoop, scoop dough onto parchment about 2 inches apart. Bake for about 10 minutes or until browned around the edges. Let rest on the cookie sheet for about 3 minutes before removing to a cooling rack to finish cooling.